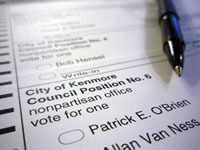 Attention readers: I would appreciate it if everyone could fill out this brief 2-minute survey. Answers are collected anonymously. I’m not asking for names, emails, or any other contact information, just a little bit of basic demographic information and your honest opinions. Since it’s been nearly four years since our last reader census, it’s time for an updated look at who is reading Seattle Bubble. I’d appreciate it if you would take a couple minutes to head over to the survey site and complete the survey. Hit most of the salient points. Interesting that the survey never had an option for “Renter” to describe your situation. Other than that, it was a good survey. RE: Erik @ 2 – Um, yes it does. I must have missed that somehow. My mistake. Isn’t a move up buyer both a seller and a buyer? A move up buyer isn’t one of the options. Choose the one that most describes you. Reading IS hard. If you don’t like the multiple choice options there’s always the last one- “Other.” Then you can create your own perfect choice. Of course this requires effort. The world is going to h3ll. We’re all going to die from a combination of laziness and entitlement. Whoa, now, Tim. That’s a little too slippery for me. Is it two minutes or five minutes? RE: Anonymous Coward @ 5 – Not if they keep their previous property as a rental. LOL… “New Ballard Remodel – Get there quick” Listed today for $599K, pending today. My total cost to have the entire 1500SF Rambler inside [ceilings too] painted and totally re-carpeted by licensed/bonded contractors, with upgraded material too, was like $5.5K; FAR less than the $100K markup this flipper prices a “remodeled” house. Hades, its probably less than the closing costs for me to sell and move. These staged homes may look nice, but don’t over estimate remodeling costs. Needs a “Renter tired of sitting back and watching two Housing Bubbles inflate in ten years” option. RE: Shoeguy @ 12 – That’s a lot of sitting. Not sure why that person would be tired. Wonder why they didn’t buy in 2011-2012. Probably because for someone in their late 20’s during the first Housing Bubble, jobs change, incomes change, and families change. The key to making the biggest purchase you will ever make in your life (and the key to a healthy and sustainable housing market instead of the current QE pumped madness), shouldn’t consist of having to time the 14 month window between the peaks of two unsustainable housing bubbles. Sounds like someone was to busy to buy a house anyway. If it helps, most homeowners buy a number of houses over their lifetime. Because of this, buying a first house is not generally the biggest purchase you will ever make in your life. Also, the market originally peaked in 2007, So even if Matthew is right (and I don’t think that he is), the window between peaks is at minimum 72 months, not 14. Now if a person is all about trying to time the bottom; 14 months is a very long opportunity rather than a very short one. When a person makes misrepresentations of these facts to himself, the world looks a whole lot worse than it really is. This may cause the person to become needlessly (and unreasonably) upset. You don’t want, er, I mean, a person wouldn’t want to do that. Now ya tell me. This could be a dead cat bounce. RE: Erik @ 16 – More likely the dead cat bounce was during the period between 2008 and 2010 when the first time homebuyer tax credits were in effect. Many markets had a pronounced ‘mini-peak’ where prices started heading back up as suckers (er buyers) took advantage of the $8K cash incentive. Most markets continued their downward trajectory for another 1-2 years as soon as the credits expired. My favorite flipper opportunity sold and is now being fixed up. Any ideas on how much the refurb costs and how much this can be back on the market for? That is a good place to fix up and sell because it looks like a cosmetic problem and built in 1982, which is means you probably don’t need to update the electric and plumbing. It depends how skilled these remodel people are and how quickly they want to get it done. I would fumble around for a year or two and do it as cheaply as possible. I am guessing that is not the case and it will be done for $100k. If I did it myself and there weren’t any big surprises, I could fix it for $30k if I just painted it, and fixed all the major existing problems. They should get rid of that T1-11 siding (vertical lines). It makes places look cheap. Too bad I couldn’t have bought that and fixed it up. I think those flippers will make a lot of money. In the future, I wanna buy one that was built in 1978 or after. Buying an old charming fixer upper is a bad investment. Mike- Yeah, maybe things will keep going up. I sold 12/13/2013. That could have been a mistake. We’ll see… I would have kept it if I had spare cash, but I kinda needed the money. RE: Erik @ 19 – I think the refurbed home will sell in the low sixes. So $100k + $364k minus RE commission sounds like a good investment. The property has a sport court on it that needs refinishing, wrap around decks on a few levels that need work, and the garage you can see needs work. And then cosmetics. I was going to contact Losh about it but did not. Not an area that I am knowledgeable in and would rather risk capital in areas that I am. Mr. Losh passed on. I think you will have trouble contacting him. It sounds like someone thinks that house prices moving like commodity futures is sustainable and that this QE fueled Pump and Dump by Wall Street won’t have serious ramifications that echo the 2008 crash. No need to misrepresent any facts. The fact is that mortgage applications are at 1995 levels and first time buyer participation is at record lows for very good reasons. The Housing Market jumping back into Bubble 2.0 like it is today is harmful, not helpful, but the again there were plenty of people in 2006 that said we were just fine and that we had nothing to worry about. Maybe you’re right, it’s probably “different this time”. RE: willynilly @ 21 – Yes. No one gets out alive. Oh dear, we are getting awfully drunk for having such weak beer. Mortgage refi apps go down when interest rates go up, and for good reason. Did you think this time would be different? First time buyers may have low participation, but sales are doing pretty well; inventory is in a state of “anti-glut” TM. What do you suppose days on the market is doing? Are you related to the shoeguy that last week decried the tripling of SFR prices since 1999? Because whether you look at NWMLS, or whether you look at CSHPI; local house prices aren’t even double. Now I realize that it is not so much a misrepresentation as an emotionally driven puke. But that guy’s error in the change is greater than the entire change itself (and over 15 years, mind you). And this is a factual matter where the facts are posted in this blog every month. It must be like being surrounded by funhouse mirrors all the time. Smart people won’t be looking to that guy for competent analysis… or street directions. I predict now that real estate and gold are more alike. The reason is simple; stocks are almost all a cash investment only [mostly the rich ‘s cash and cash retirement Hedge funds], while gold can be bought on “debt” margin just like real estate with a mortagage loan. Another problem with real estate alone [not so much gold] is its future is recently shifted to the unskilled underemployed and P/T wage levels evolving today, for college graduates forced to work the old highschool diploma jobs today too. The unlucky Millenials are the key to any future real estate bubble, whether you like it or not. Gold futures are sold when the equity of a business or 2nd mortgage default is threatened….IOWs, unstable. Real estate is sold before foreclosures occur, most of the time, when household incomes collapse….IOWs unstable. Stocks are sold too, but usually reinvested right back into stocks by the savvy [or not so savvy] stock investor with almost all “cash”. The 22% interest you got from stocks in 2013 is the only decent return on savings, beats negative 1-2% interest on longterm bonds and 1-2% interest on longterm CDs. What’s left for cash investors today but stocks? The stability of the stock market can be questioned too, but the stock bears were all wrong the last 6 years….my prediction for stock futures today is cloudy, but I’ve rode it out the last 6 years anyway [I was lucky]. Let’s put it this way, I’m an upper level single income, who’s really an upper level double income in 2013 for my luck….it certainly wasn’t my prediction. This new paradigm shift I made on investments is not a prediction, because I once thought like you too. I’m not haughty. RE: softwarengineer @ 25 – You can buy stock on margin. Thank God good companies like MSFT avoid this trap. Apparently, the DOW is already sifted to avoid companies with debt stock purchasing eliminating free cash access….they’re taken off the DOW if they aren’t performing with risks at getting at “cash dividends” for investors. During the 2013 sequestration money could be borrowed from civil service government longterm CDs to keep it solvent….but not from the civil service stock funds….they’re a “locked box”. My my, you sound pretty defensive. Lift your arms in the air and stand on your tippy toes to make yourself look bigger! Tell me, what year did you catch that falling knife? 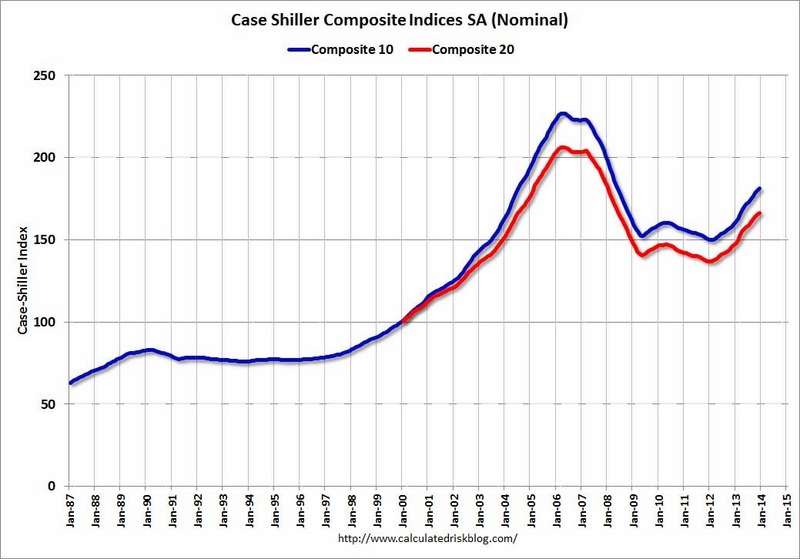 Has that temporary 25% shoot back into Housing Bubble territory got your nose above water yet? So I take it that you are the shoeguy who was more than 100% wrong in the 15 year price change. Lucky guess? No, I noticed the pattern where you confused 14 months with 72 months, misidentified “the biggest purchase you will ever make in your life”, and claimed to magically predict sales by counting mortgage applications in a declining refi market. This is your lucky day because it’s my 5th post, so I won’t be able to counter your unfounded assumptions, misstatements of fact, and non sequiturs. Yay, you! Almost forgot: Never been close to underwater on any of my houses. Maybe in a couple years I’ll rent one to you. That’s right. Everyone on the internet is rich and has a supermodel wife. Don’t worry. There will be plenty of other posts where you can endlessly gnash your teeth. Numbers don’t lie, and we’ll see the numbers drop soon (as well as the number of housing bulls that post on this board). I know the bubble is back when I start seeing comments again such as “Maybe in a couple years I’ll rent one to you” That was a common refrain here in ’06. Might as well throw in a reference to his mother’s basement for extra points. The Census piece goes above the new ones. Look below! RE: softwarengineer @ 32 – You must have a really short monitor. I shortened the length of the Census post and stuck it to the top of the page, but new posts have been going up all week just below. Ha! This got me too for a while. My RSS feed kept showing this post at the top so I just thought Tim had gone on vacation or something, lol. RE: SS @ 36 – Oh that’s interesting, I didn’t know that pinning it to the top also affected RSS readers. What feed reader are you using? The key to biggest purchase is not buying at all if your life is unstable as to job…life-wife…etc. Things happen, but you should have the expectation of long term stability when buying. OR buy something you can easily hold as a rental if that is the best course of action when the time comes, and know at time of purchase that is your exit strategy. Another option is to buy something you can easily improve as to value vs buying a recently flipped house where someone else sucked up the future equity for years to come. Did everyone see me on Dancing With the Stars last night? It was awesome, but the addition of the Disney cartoons was hard for us in the studio to get our brains around with no visual. The studio version is live to the East Coast vs West so I was able to see it shortly after we exited the studio with the cartoon characters placed into the dances. Awesome experience. Apologies for the brain fort. RE: ARDELL @ 41 – This is the type of thing where advance notice would help so that we could look for you. What was security like, besides the phone/camera restrictions?